NEW YORK, July 11. /TASS/. The US-made cargo resupply vehicle, Cygnus, successfully completed a maneuver to raise the altitude of the International Space Station (ISS) on Tuesday night, a US space official told TASS. Daniel Huot, a spokesman at NASA Johnson Space Center in Houston, said the operation was a success. As a result of the 50-second burn of the spacecraft’s engines, the Station’s altitude was raised by 295 feet, or about 90 meters. According to initial plans, the ISS altitude was to be increased by 156 meters on average. The adjustments of the ISS orbit are usually carried out by engines of Russia’s Progress space freighters or the Zvezda module, as well as by Europe’s ATV spacecraft. 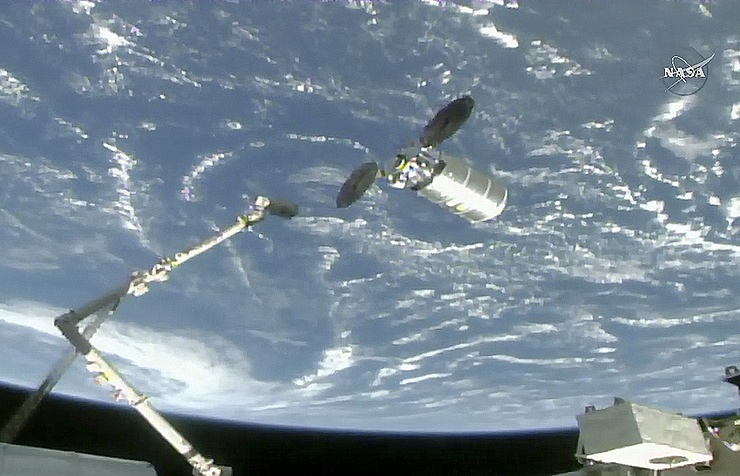 Cygnus is to undock from the space station at 15:15, July 15. The space station’s crew includes Roscosmos cosmonaut Sergei Prokopyev, NASA astronaut Serena Aunon-Chancellor and astronaut of the European Space Agency Alexander Gerst, who arrived to the station on June 8. They were received by Russian cosmonaut Oleg Artemyev and US astronauts Andrew Feustel and Richard Arnold aboard the International Space Station.